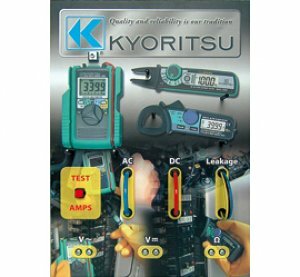 This panel demonstrates the operation of all Kyoritsu AC, AC/DC and Leakage clamp meters including the special open jaw AC/DC clamp meters like KEW FORK 2300R or KEW MATE 2000 series. It features the "actual size" photos of 3 different instruments. However for an effective demonstration, real samples of these instruments should be attached to the panel using a simple anti-theft cable supplied with the panel. This panel generates approx: 15A AC and DC, 30 mA AC of leakage current, 12V AC, 15V DC and 10Ω. The current values can be measured by simply clamping the wires or, for voltage and resistance values, touching the metallic test points on the panel with the instrument test leads.